THE PESSIMIST VERSION: If you love somebody, Set her free ... If she ever comes back, she's yours, If she doesn't, well, as expected, she never was. THE OPTIMIST VERSION: If you love somebody, Set her free ... Don't worry, she will come back. THE SUSPICIOUS VERSION: If you love somebody, Set her free ... If she ever comes back, ask her why. THE IMPATIENT VERSION: If you love somebody, Set her free ... If she doesn't comes back within some time limit, forget her. 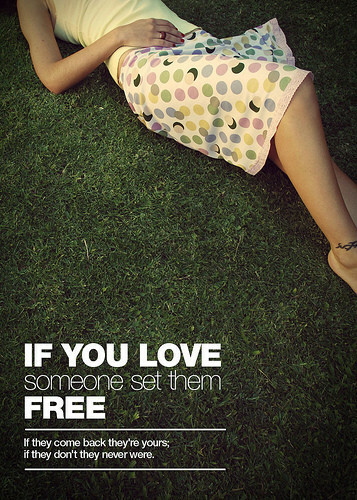 THE BILL GATES VERSION: If you love somebody, Set her free... If she comes back, I think we can charge her for re-installation fees and tell her that she's also going to get an upgrade. THE STATISTICIAN'S VERSION:: If you love somebody, Set her free... If she loves you, the probability of her coming back is high If she doesn't, your relationship was improbable anyway. THE POSSESSIVE VERSION: If you love somebody don't ever set her free. THE MBA VERSION: If you love somebody set her free... instantaneously... and look for others simultaneously. THE PSYCHOLOGIST'S VERSION: If you love somebody set her free... If she comes back, her super ego is dominant If she doesn't come, back her id is supreme If she doesn't go, she must be crazy. THE FINANCE EXPERT VERSION: If you love somebody set her free... If she comes back, its time to look for fresh loans. If she doesn't, write her off as an asset gone bad. THE MARKETING VERSION: If you love somebody set her free... If she comes back, she has brand loyalty If she doesn't, reposition the brand in new markets.